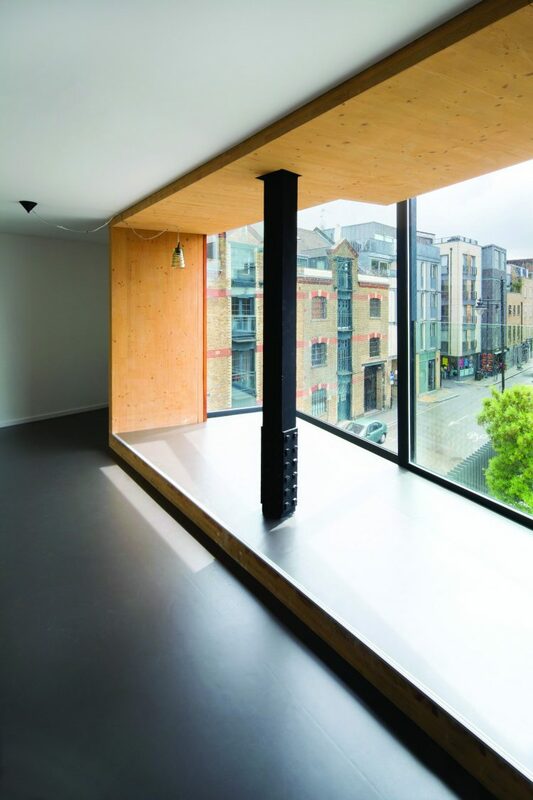 Cross-laminated timber provided an ingenious structural solution as well as a crisply-lined urban aesthetic for the refurbishment and extension of 142 Bermondsey Street in Central London. Stephen Cousins reports. The groundbreaking structural capabilities of cross-laminated timber (CLT) have raised eyebrows in recent months through several major projects such as HAUT, the world’s tallest all-wood residential tower due to be built in Amsterdam, and the 84 metre HoHo tower project in Vienna. Less well publicised is the material’s suitability for smaller scale projects faced with challenges such as restricted site access in urban areas, or limited load bearing capacity on foundations or existing structures. 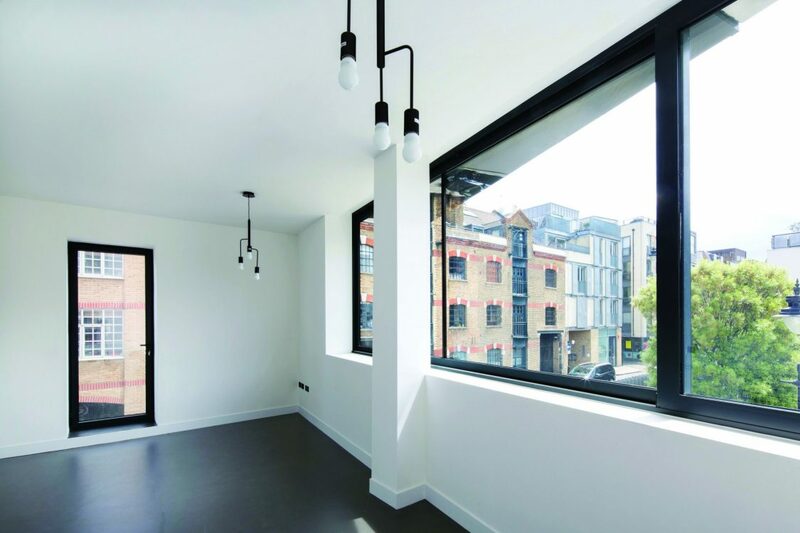 CLT helped breathe new life into a fast-crumbling building at 142 Bermondsey Street, in the London Borough of Southwark, where it was used to extend the property and give the interiors a soft, precisely crafted finish. Designed by Hampson Williams Architects, the high-end mixed use development has a 268 m2 gross internal area and cost approximately £660,000 to build. It comprises the extension and refurbishment of an existing unlisted post-war steel framed building to create a small one-bedroom apartment, a two-bedroom penthouse, and a retail unit at ground floor, with a separate live-work unit at the rear. A total of around 45 machine-engineered CLT panels were installed, in combination with structural glazing, to extend the single-storey rear of the building vertically by two storeys, and create the new top storey penthouse. 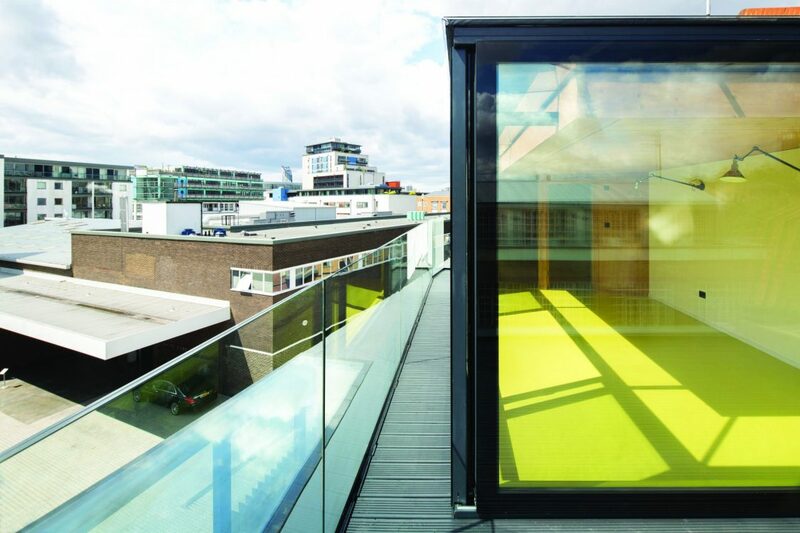 The penthouse features a striking cantilevered glass box that projects out over the adjacent road, lined internally by a CLT box framing views to the south. CLT is fast establishing itself as a quicker and more sustainable alternative to concrete or steel structural frames. The prefabricated panels are formed using two-way spanning sections of timber that are glued together to create a light, stable and very strong structure suitable for building walls, roofs and floors across a wide range of building types. 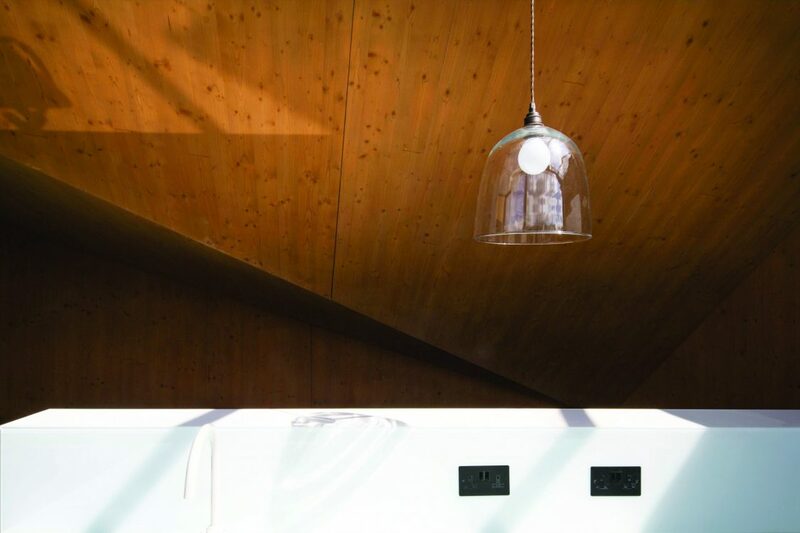 CLT panels are available in a variety of sizes and because they are made from readily available softwoods, they are low-waste and carbon negative in terms of embodied energy. Timber acts as a ‘carbon sink’ and across its product lifecycle has the lowest energy consumption of any building material. 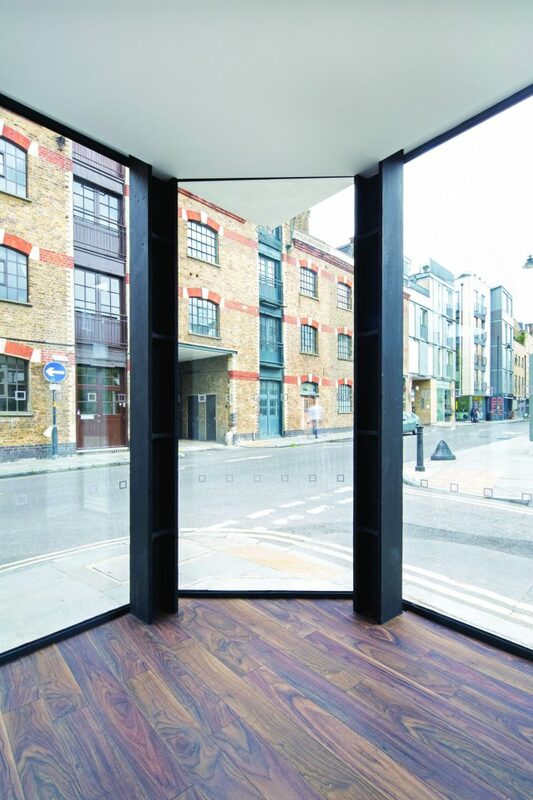 142 Bermondsey Street is located at the end of Lamb Walk and creates a contemporary bookend to the historic Bermondsey Street which, in recent years, has become a trendy and popular part of the Borough. The client is a well known and loved community figure, who has lived in the area all her life, and at this specific property for over 20 years where she also ran an antiques business. She commissioned the project to maximise the potential of the site, by fusing the old with the new, and wrapping the facade around the street corner to exploit open views and south facing sunlight. 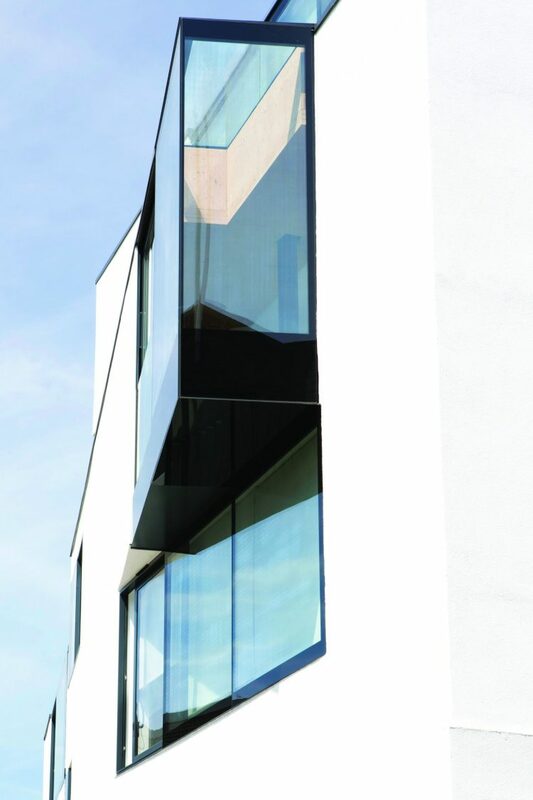 The building’s form was developed through a scale study analysis of the street frontage balanced with the need to retain daylight/sunlight to a ground floor residential unit at 140 Bermondsey Street. 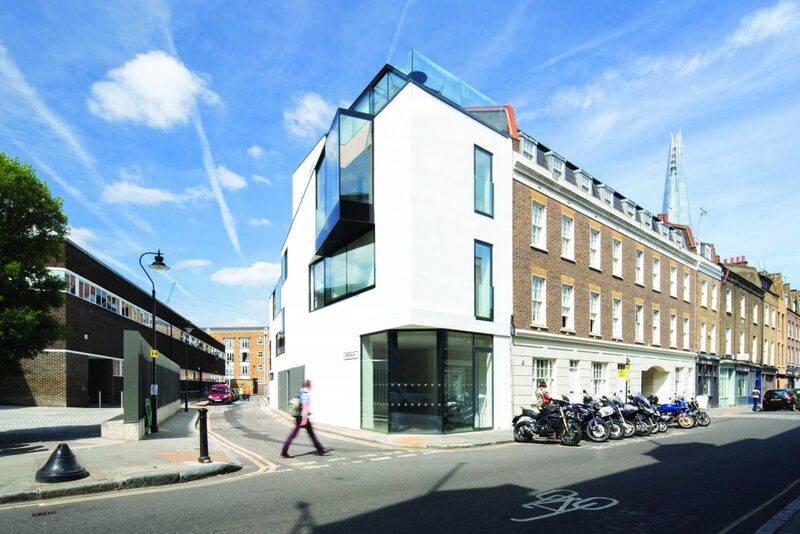 Externally, the building is a simple white box with an industrial appearance, developed to meet planning requirements for the local Bermondsey Street Conservation Area. The new walls of CLT are covered in a layer of insulation and a surface layer of white render. Internally, the timber is left exposed to reflect the original building’s industrial/workplace aesthetic, which is also characterised by exposed steel columns and connection plates and other original features. The use of CLT for all new elements of construction was informed by several factors. The lightweight nature of CLT generally enables foundations to be designed smaller and cheaper. At 142 Bermondsey Street it entirely removed the need to dig new foundations by minimising additional loads onto the existing footings. “The building’s age meant there was a very limited capacity for extra loading on the foundations, which required a lightweight construction solution,” says Hampson. In addition, the property is located in an area of Archaeological Interest close to a riverside and any excavation work would have increased the risk of uncovering relics, potentially leading to site closures while archaeological work was completed. “Previously, we had carried out a design and build project nearby where Roman sandals were uncovered during excavation and that whole section of the project had to be closed down for six months. 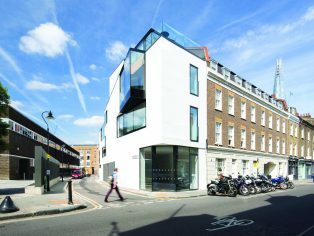 We were quite conscious of those sorts of issues on Bermondsey Street and tried to minimise any groundwork,” adds Hampson. Utilising CLT made logistical sense as lifting prefabricated panels into position quickly by crane reduced construction time to just two and a half weeks, and with limited space for deliveries, it minimised disruption and the need for road closures. Construction was further simplified by limiting the need for wet trades like plasterers and painters. In addition, the precision-engineered airtight design helped upgrade the building’s insulation standards and thermal performance, which were very poor. The detailed design, supply and installation of the CLT was carried out by Eurban, the only UK contractor delivering solid timber building structures with a fully trained, directly employed labour force. 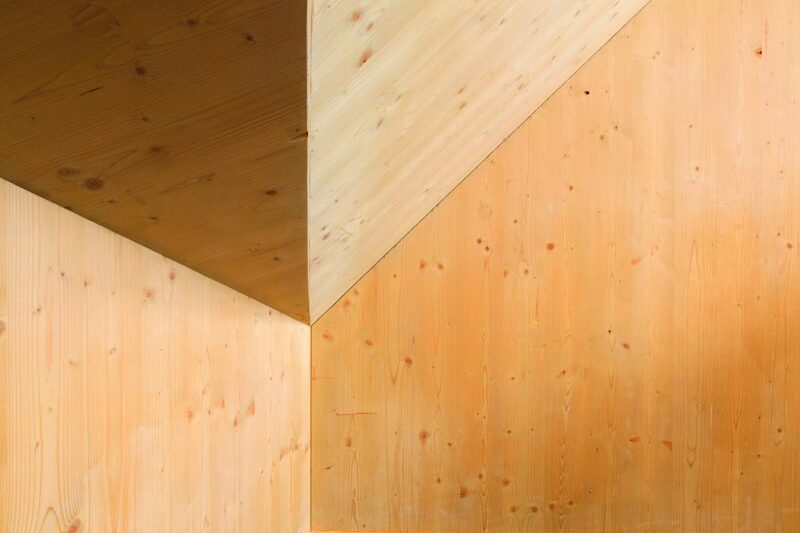 The CLT product was manufactured by Finnish firm Stora Enso and comprises solid wood boards edge-glued and cross-laminated together to form large panels, suitable for wall, floor and roof applications. 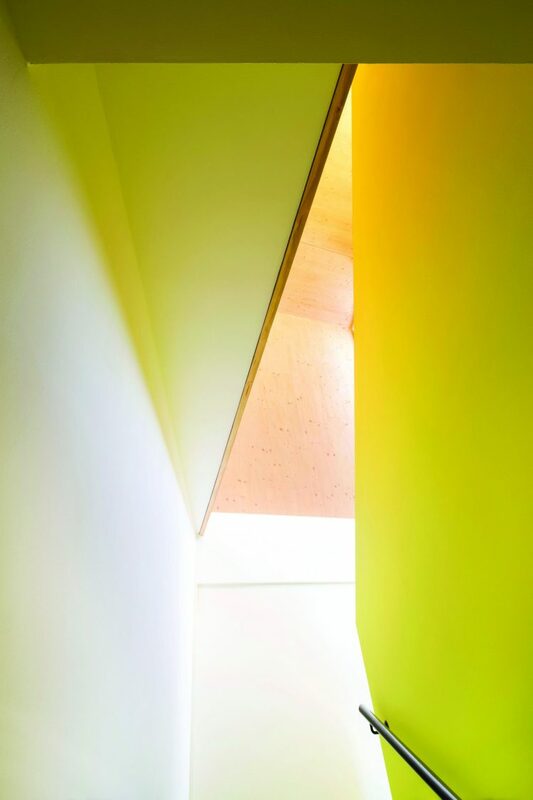 The dimensions of each panel at 142 Bermondsey Street varied hugely due to the bespoke nature of the project. Eurban only supplies CLT panels manufactured with edge glued (closed) faces, which provide an increased performance for air-tightness and are better able to cope with British weather conditions. The firm requires that panels from all its suppliers are bonded with non-formaldehyde adhesive to reduce environmental damage. Achieving high air tightness and +/-1 mm tolerances required close design collaboration between the architect, main contractor, Cityline Construction, and Eurban, from an early stage. Accuracy was made challenging due to the fact the site was not only tight but also very angular, and the timber would stand on an existing post-war structure, built to less demanding standards with various kinks and inconsistencies. A digital survey of the existing building was initially completed then modifications made to the structure to create a 100 per cent level surface to found the CLT on. 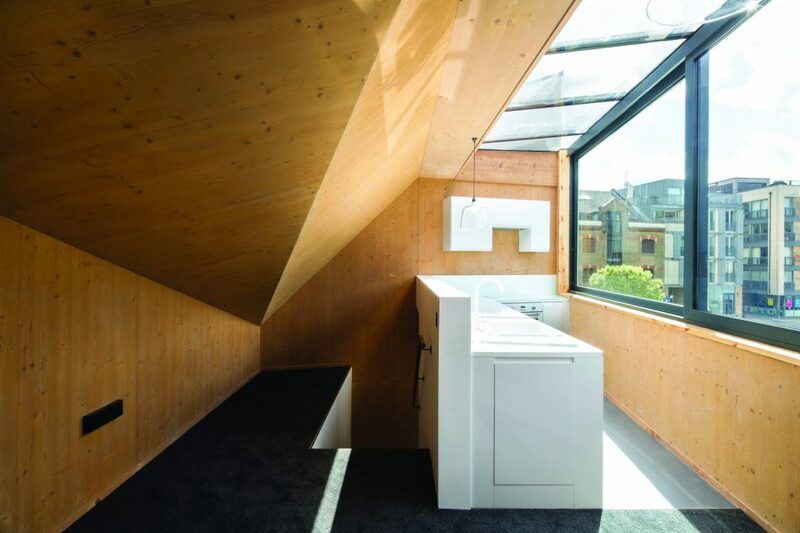 According to project architect Chris Hampson, building in exposed CLT is less forgiving than brick and block construction, which is often covered with plasterboard, or skimmed and painted to conceal any blemishes. 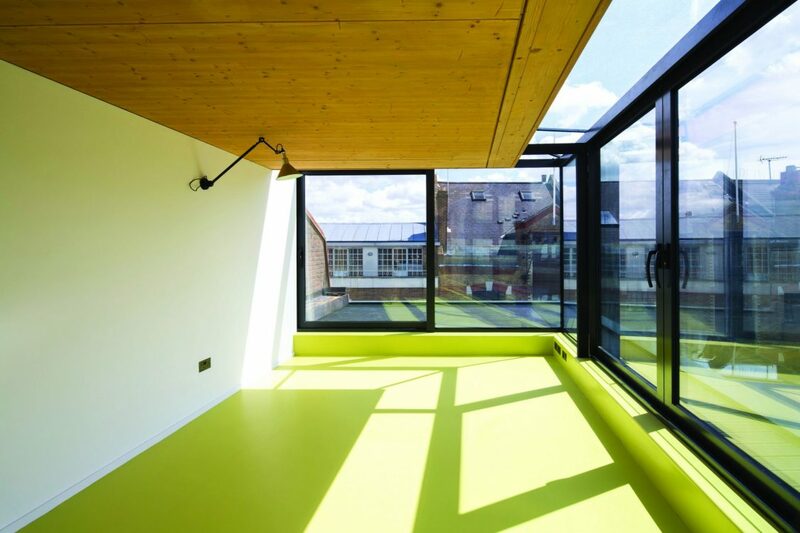 “We are familiar with CLT, having used it several times on past projects, including a school block in north London made almost entirely of timber and some housing for the homeless, built in brick with a CLT ‘lid’. We always like the way it fits together, the structural dynamics and thermal properties. For this project, on a tight inner city site, the speed and ease of construction was crucial,” he concludes.